Road Atlanta in Braselton Georgia the home of Petit LeMans and another great old school and intimidating track. 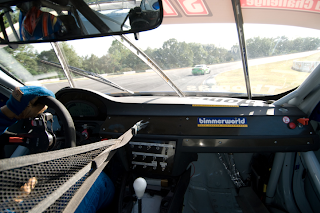 Built in the 1970s and eventually rescued by Don Panoz, the track was most recently part of the merger deal between ALMS and Grand-Am. 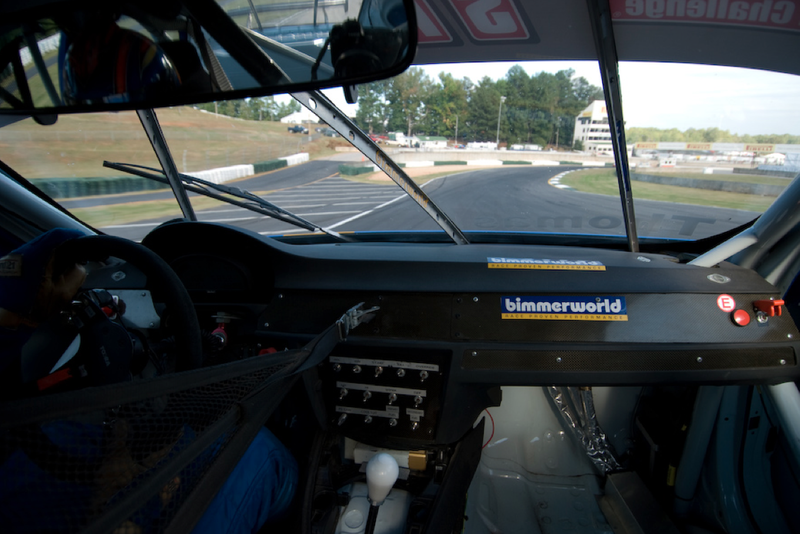 The track is literally in Bimmerworld Racing Seth Thomas's back yard so who better than a Georgia native to give up some of the secrets of the esses? Road Atlanta has always been my home track as I was born and raised 20 miles away. My very first memories of sports car racing are of going to the track with my dad in the 80’s to watch the glory days of IMSA racing. I still remember vividly the Camel GTP cars coming through the famed “Dip” and crest the hill at Turn 11 at speeds in excess of 100 MPH, right side mirrors about to touch the wall going under the bridge. As a young kid I always thought about how cool it would be to drive one of these cars at Road Atlanta. 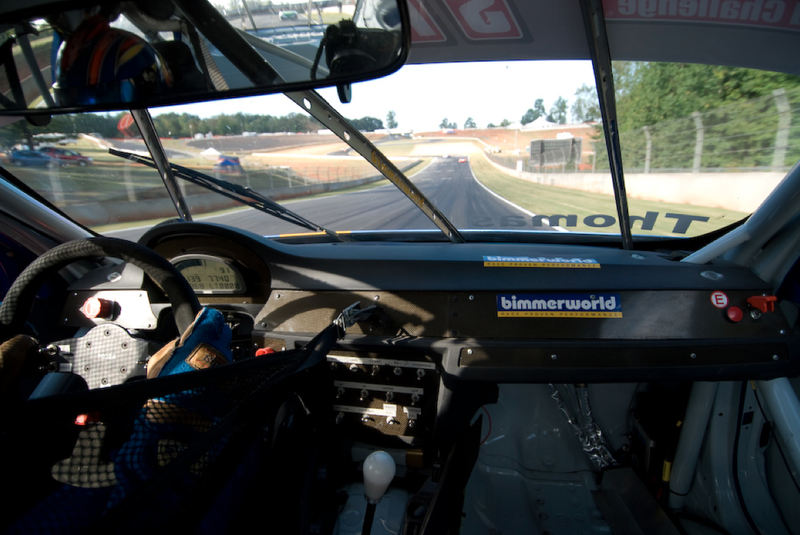 Fast Forward to 1998 when the opportunity to drive Road Atlanta arrived when I signed up for a Track Day with the BMWCar Club of America. This was my first event with my new to me 1997 BMW M3. I was hooked. I started looking for every track event at Road Atlanta I could attend. 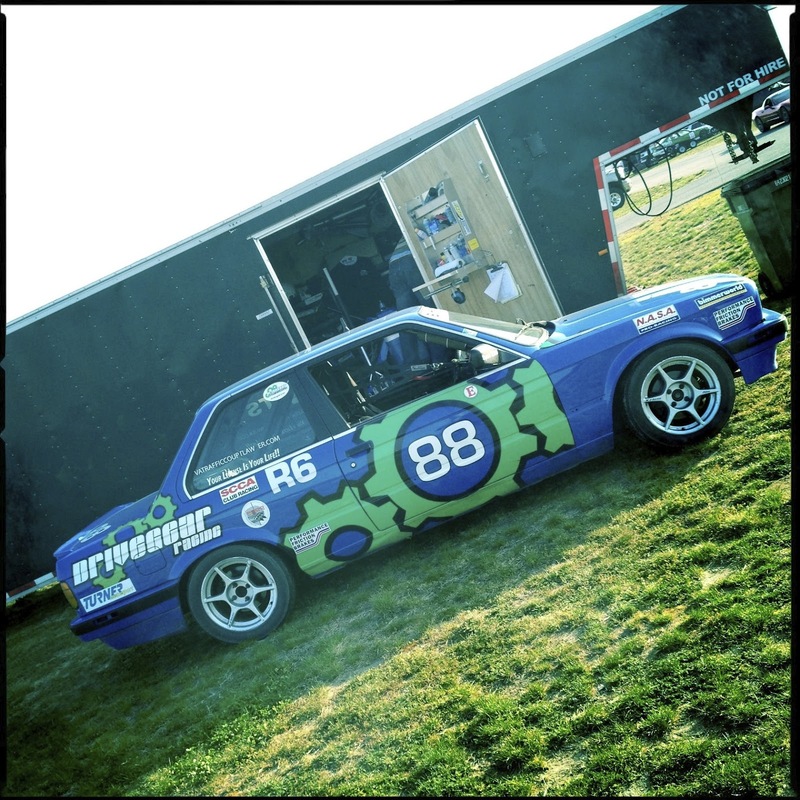 Then I started racing in 2001 in a ITB 1984 BMW 318. This car helped teach me the line around the track. Since then I have modified the line I started learning at Driver’s Ed events to the one I use to race. 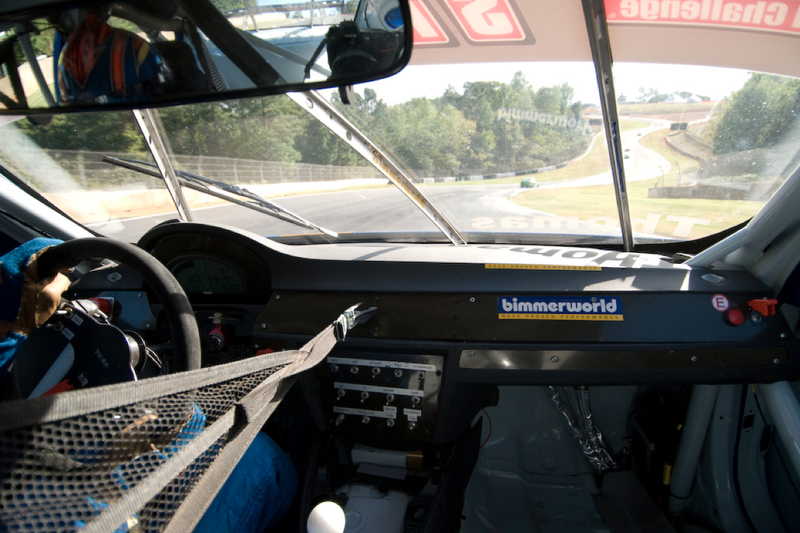 Racing for BimmerWorld in the Speed World Challenge Touring Car helped hone my line around Road Atlanta. Those cars were fast with a small tire with very little grip but the lap times were similar to a Porsche 996 GT3 Cup Car. 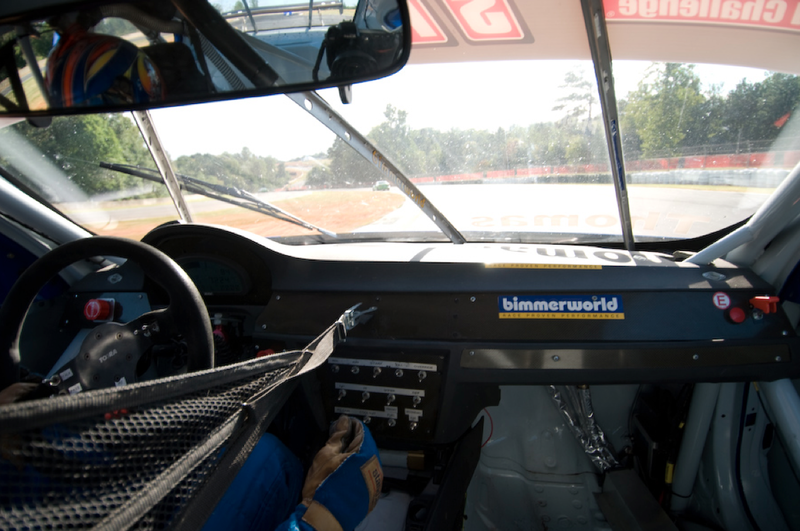 For my friends at Axis of Oversteer here is a detailed lap around my home track of Road Atlanta including pictures from inside the 2007 BimmerWorld BWM 325 Touring Car. 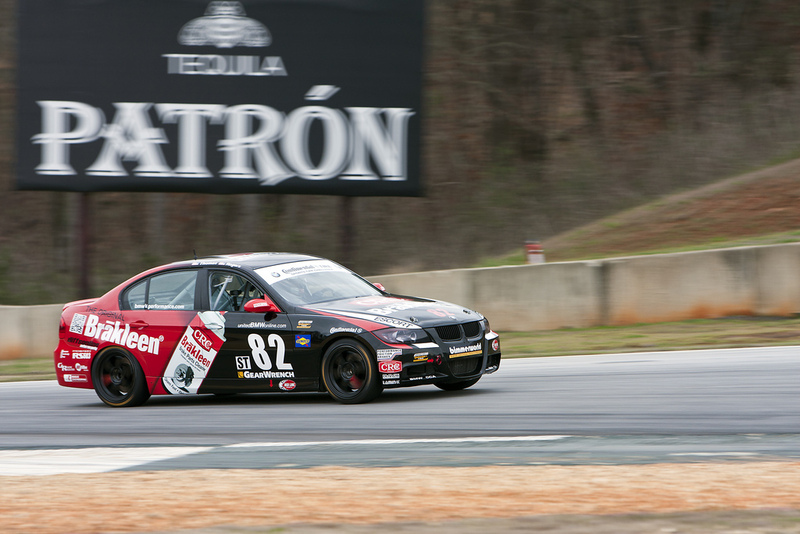 A lap at Road Atlanta starts with a fast run through T12 onto the front straight. This straight is not very long but it is fast as the entry speed is around 110-120 MPH. The important part to remember here is to look ahead for the brake markers for Turn 1 and pick them up with your vision as early as possible. 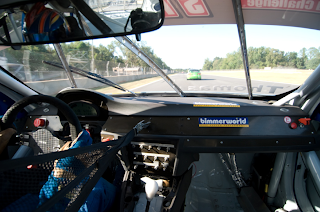 The exercise of finding the brake markers as early as possible will help you for the rest of your lap. Turn1 is a very fast constant radius right hand turn featuring both downhill and uphill changes in elevation. It slopes downward a small amount in the brake zone down to the apex and gains elevation from the apex out. It is important to take note of these changes to maximize grip and speed in all the stages of Turn1. Heading into the brake zone for T1 the speeds will be around 120-130 MPH. Line the car up with the left side of the track. The importance here is to give yourself as much track surface as you can so you can roll big speed through Turn 1. 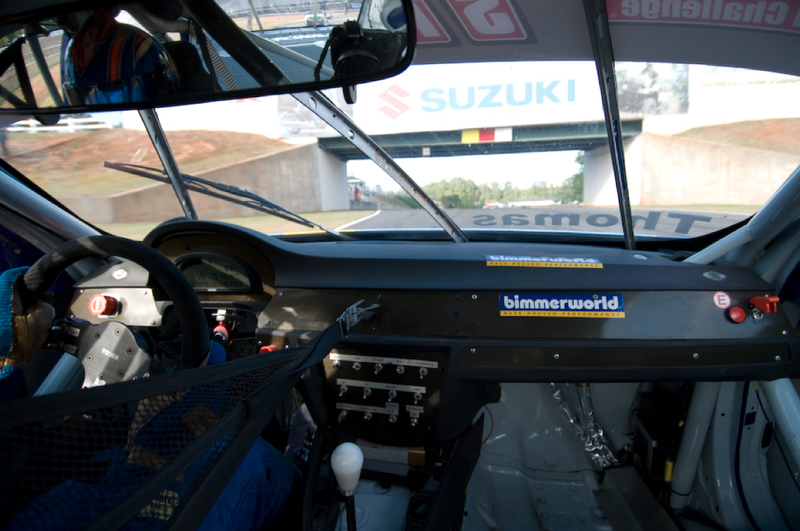 This is the second biggest brake zone of the track but be careful not to overslow the car. I tend to give the car a big hit of the brakes on initial brake pedal application but roll off the pressure on the pedal fairly early to get the front tires ready to turn in with speed. As I start to bleed off brake pedal pressure I slowly start to turn the car in a tiny bit early as the track starts to slope downward and the cars starts to slightly understeer. I release the brakes a little early to roll the speed down to the apex. At the apex point is the transition from downhill to uphill and the front starts to gain grip again. This is when I transition my right foot to the throttle pedal and start to aggressively apply throttle. I want to use the grip gained by the uphill run to help the car accelerate out. 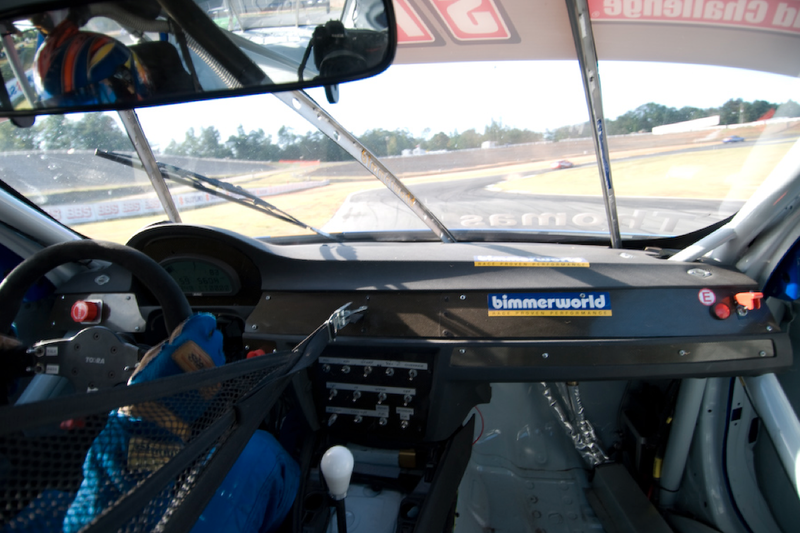 Once I turn in for Turn 1 I do my best to maintain the same steering input throughout the whole turn. Use the majority of the track but remember to start the setup for Turn 2 on the exit. Turn 2 is a slight left hand turn at the crest of the uphill run out of Turn 1. The exit for Turn 1 determines how you setup for Turn 2. I see a lot of guys exit Turn 1 and start to bring the car back to extreme track right to setup for Turn 2. 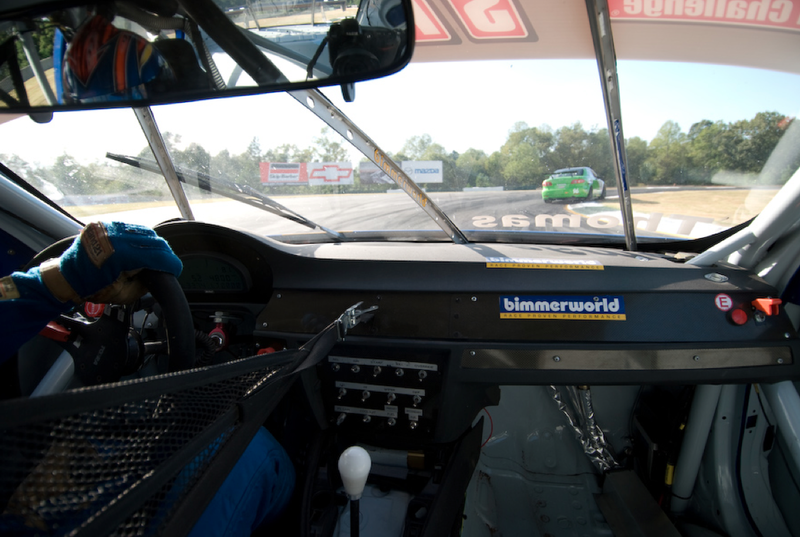 I don’t feel this is beneficial because in order to do so you have to keep steering input in the car for too long, loading up the left side then asking it to turn quickly right followed by brakes and turning left for Turn 3. This is way too much going on for the suspension and the tires in a short distance. I tend to exit Turn 1 and keep the car on the left half of the track and placing it no further than the half-track point. This creates a small little straight heading into Turn2 shortening the distance from Turn 1 to Turn 3. Turn 3 is a short right hand turn with a big curb marking the apex spot. This spot is a great place for photographers as they get an action shot with both right wheels up in the air from guys using a lot of the apex curb. Entering Turn 3 there is curbing on the left hand side of the track. I like to brake early with a light application of the brakes before the curbing until I turn in Tickle the curbing with the left side tires but do not get on top of it. Using too much will upset the car during braking. A common mistake in this brake zone is to charge in, braking at the last minute. This mistake overloads the front tires and causes big understeer. Have your vision looking through the apex curbing so you create straight line through the section to Turn 4. Right before the end of the curbing turn the car in so the right side of the car aggressively hits the right side curb at the apex. At the apex the attitude of the car should be relatively straight, making the airborne attitude of the car non eventful. When the car lands is the point I like to squeeze on the power and start my run through Turn 4. Turn 4 is a sweeping left hand turn where the track starts to transition to the downhill section for the famous esses. Turn 4 starts at the track out point for Turn 3 so you are trying to accelerate from turn in to exit. Exiting Turn 3 places the car right at the edge of the curbing for Turn 4. For this reason I like to hug the inside curbing of Turn 4 as long as the car can. 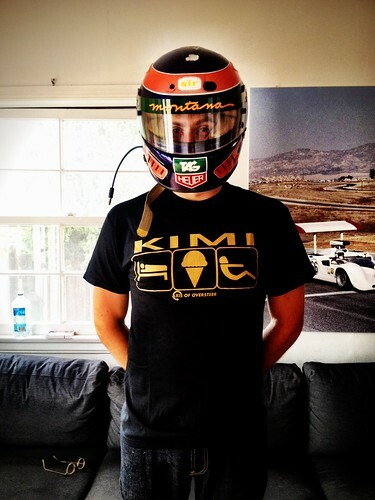 Because you are accelerating around the turn most cars like to understeer at the mid corner part. 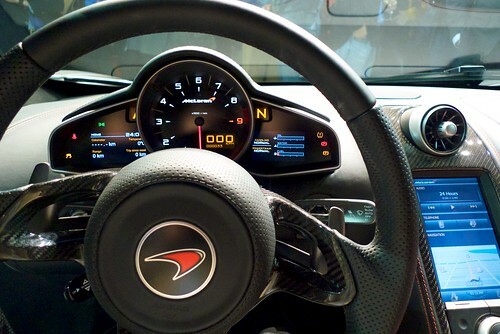 In a high horsepower car I will tend to short shift to the next highest gear at this point. The shift is a short lift off the throttle allowing the front to regain some grip and it will help to better setup for the entrance to the esses. 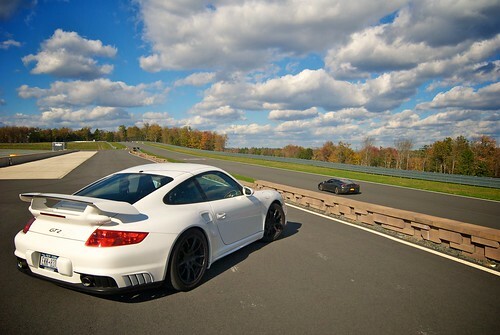 Don’t go anymore than mid-track at the track out because it is important to get setup for the entrance to the esses. Most cars benefit from short shifting to a higher gear at this point. It allows more grip on the front end of the car to turn in for the esses and it helps the car to relax. 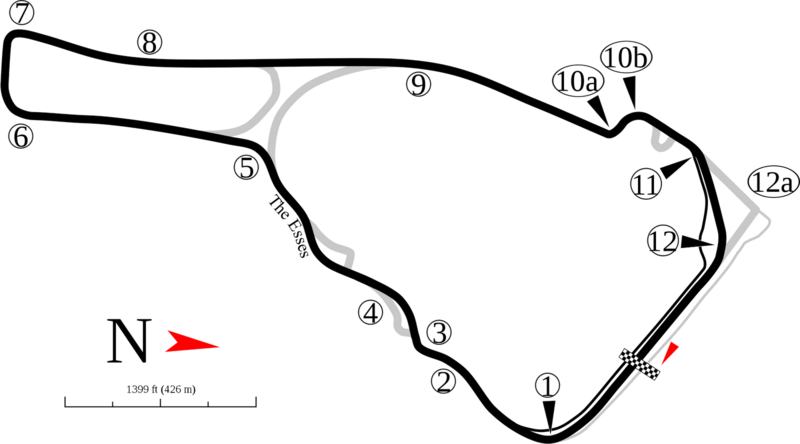 The esses are a combination of 3 turns all connected together by both downhill and uphill elevation changes. This is a fast section of the track with very little run off room. Slower cars (SpecE30, SpecE36, Spec Miata, Etc) will be in 4th gear but some (GT3s, M3s, F430s, etc) like an early shift to 5th gear to allow better acceleration through the whole section. I like to point out to everyone to notice how much of the track you can see through this section. From turn in you can see all the way to the exit of Turn 5. This visual gives you a quick glimpse of where the car needs to go and helps the mind tell you where to place the car through the whole section. Turn in for the esses can vary a little as the exit of turn 4 speed determines the car’s postion. The main goal is to try to get the car to track left but sometimes this isn’t possible as the speed of the car exiting Turn 4 won’t allow it. If I can’t get the car back to the left then I do the best I can to get track left and turn in as close to the left as I can. Tickle the first little inside curb. Use your eyes to now create a straight line from the first apex to the second apex. If this means using the top of the curb at the bottom then give it a try. The curb is soft and smooth with lots of grip. Taking the curb will help set the car up with less steering input for the entrance to Turn 5 and will help to create a shorter distance through this section. Turn 5 is an uphill left hand turn with an approach similar to Turn 3. I prefer to get slow the car early so I can get a better launch coming out since it is followed by a short straight. I enter with a small amount of steering input to the right. Be very light on the brakes at the spot the right side of the car slightly touches the outside curbing. I like to use a very light application of the brakes to get the car slowed down early. Right after I touch the brake pedal I start my downshifting to 3rd gear. The objective is to get the downshifts and braking done early. Visually I am looking through the apex connecting it with the track out point before I start to turn in. I turn the car in a little bit early as the car will understeer slightly until the front tires bit into the uphill portion of the turn at the apex. At the apex point (front tires are starting to grip) I become very aggressive with the throttle. My goal is to be full throttle by the apex and let the car drift to the outside curbing going up the hill. If I need to I will use all the outside curbing in car shod with R-Compound tires. With Slicks I do my best to stay off the curb. As I come out and crest the small hill I straighten my hands as my path from here will send me straight to the brake zone for Turn 6. A big mistake I see a lot of drivers make in Turn 5 is to add too much steering while trying to get the car to the left on the exit causing the car to oversteer. 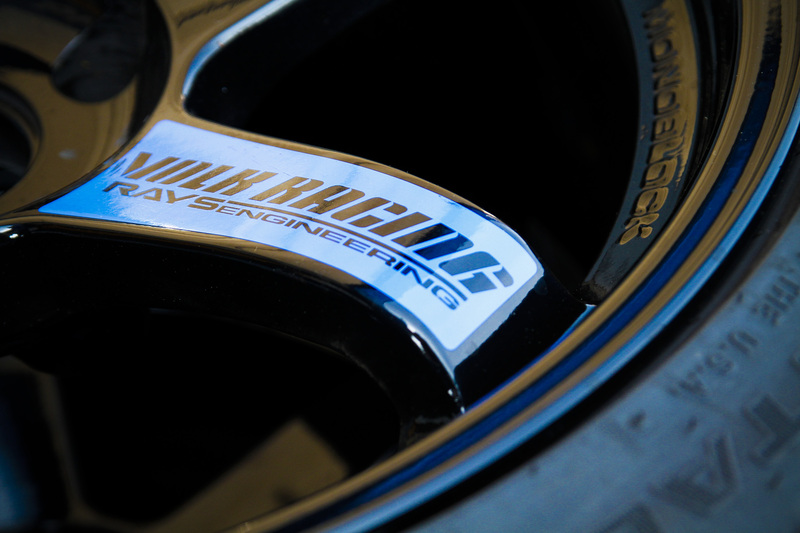 Straightening the wheel helps to alleviate this problem and keeps the car accelerating at full speed down the short straight. Turn 6 is a tricky turn as it has a lot of banking and it followed very quickly by Turn 7. I like to carry big speed into Turn 6 using the banking to give the car a little bit more grip and sacrifice my exit speed a small amount so I can make setting the car up for Turn 7 easier. On the entrance to Turn 6 there are 3 brake markers and 3 hash marks. I brake around the 200 brake marker. I look at the apex and when the nose of the car crossed over the 2nd hash mark I start to slowly turn the car in. I trail brake slightly to keep the nose planted as the left front tire starts to dig into the banking. This gives me a little bit extra grip for the speed. Usually I am in 4th gear to make sure I don’t over slow. At the apex I feel the car dig in to the banking and I start to apply the power. At this point I do what I can to keep the car from getting up on the exit curbing as I am focused now on setting the car up for Turn 7. 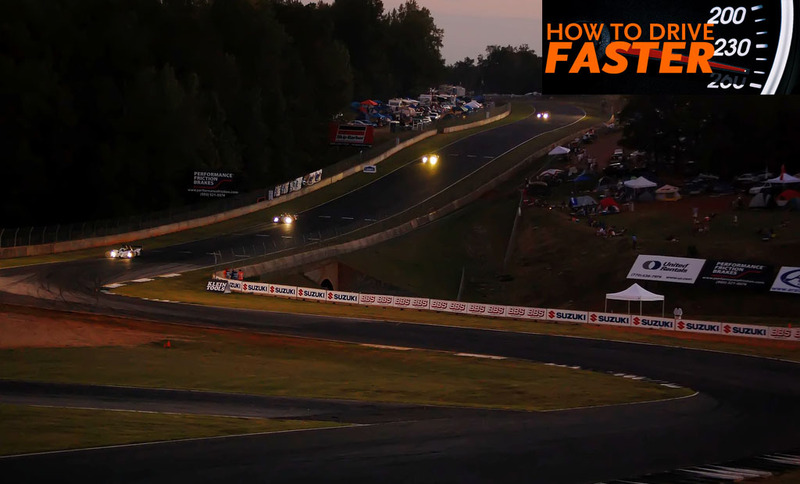 Turn 7 is one of the easiest and hardest places to make time at Road Atlanta. The focus on Turn 7 should be on the exit speed and not the apex speed. I like to brake a little bit early and easy before turn in. My reason for braking early is I want to make sure the entrance is smooth and on the mark. 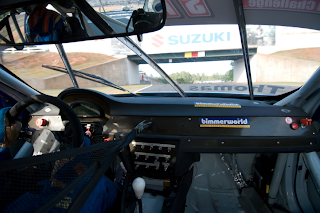 If I am late or hard on the brake I find it is harder to get the front to turn in and I can lose exit speed. I choose a late turn in, similar to a rain line, which gives me a slow turn in speed but gets the front end of the car pointed down the back straight 20 feet quicker. This 20 feet of earlier throttle usually gives me only 1 MPH or so better straight line speed but that is over 2700 feet of track. The exit of turn 7 is all about doing what you can to not lift off the throttle and to limit wheel spin. There is a small curb on the exit that can be used if needed. It is smooth on the top and gives you more track surface on the exit. The goal in Turn 7 is once you start to touch the throttle in Turn 7 you stay in the throttle. This will help to make the time down the back straight as short as possible. This one is easy. Goal is to keep the car straight and shift as quickly as you possibly can. Most cars like to stay on the left hand side of the track as they are approaching the black flag station (on the right). The track takes a slight turn to the right at the black flag and staying to the left opens up this small turn. In most cars I am shifting at the black flag station to 5th gear. After accelerating up to the highest speed on the track we approach the next section of turns known as Turns 10A and 10B. These turns are very close to each other and the exit of 10A determines speed through 10B and down into Turn 12. What makes this section of track tough is 10A and 10B are relatively slow and they are right after the fastest straightaway on the track. 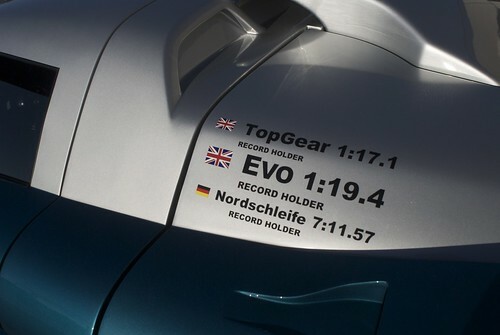 The car has to be slowed down from speeds in excess of 140 MPH to around 60 MPH with a downhill brake zone. The brake zone starts at the 200 marker or just inside. 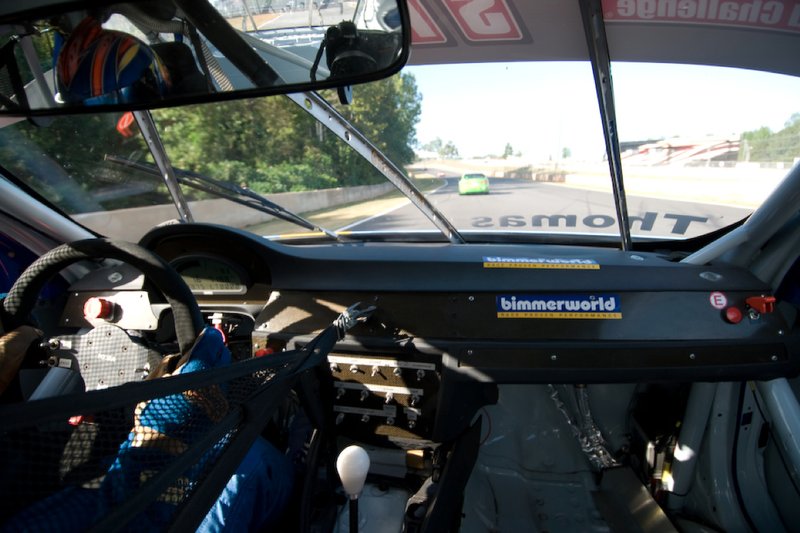 On the track there is a black section the width of a car where there is a small dip. This is the brake marker for most cars. It is close to the 175 Foot mark. I apply a big initial hit on the pedal as I want to plant the nose on the front tires and get maximum braking done at the highest speed on the track. As I am slowing the car down I am looking at the apex thinking about what speed I need to be at the apex. I also notice I can see not only T10A but T10B and The Bridge. I go down from 5th to 3rd gear. 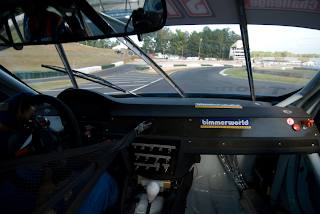 My focus is to use as much of the apex curbing as I can to keep the car lined up on the inside of the turn. I treat Turn 10A very similar to Turn 7 on the entrance and apex as I want to focus more on the exit than the entrance. So I hug the apex and keep the car tight against the inside of the track. This gives me a better setup for Turn 10B. At the apex I am looking up to Turn 10B. 10B is an uphill right hand turn. This turn starts the run onto the front straight especially in a low horsepower car. This makes the run out more important than the apex speed. Keeping the car tight exiting 10A helps give a longer run on full throttle setting up for T10B better. I use as much of the apex curb as possible and let the hill help give both the front and rear extra grip. My goal is to be full throttle apex or slightly before using the uphill run to help gain traction. As I am exiting I don’t like to use the track out curbing as I find it a little rough and causes oversteer. I treat the exit here very similar to the exit of Turn 7. Try to be on the power enough to always be accelerating out and not spinning the tires. As I exit the uphill secton of Turn 10B, I approach the famous bridge and the downhill run into Turn 12. The bridge is at the crest of the hill making it hard to see what is on the other side. Placing the car in the right spot is really important but easy to do. Just have faith going over the hill! I like to put the driver’s seat under the Red Square going under the bridge. Placing the driver’s seat under the Red Square will help give the car a straight line over the hill down to the turn in point for Turn 12. As I go under the bridge I shift from 3rd to 4th and stay in the throttle as I first start to go down hill. I relax my hands, straighten the wheel, and start looking down to Turn 12. From this point I can see the turn in and apex of Turn 12. Turn 12 is the turn you close your eyes and hope for the best. Just kidding. It is scary with very little runoff room and surrounded by concrete walls. Get this one wrong and the car starts bouncing off walls. Get it right and the lap will be super fast. This turn is downhill so the car is accelerating the whole time on entry. It then levels out as you are still accelerating into the apex. I like to top the hill staying full throttle in 4th gear. For a brief second I straighten the wheel to put the car up along the edge of the turn in curbing. I turn in right at the end of the curbing with a small lift at turn in if needed. I try to stay on the throttle about 50% at a minimum to keep some weight on the rear. As I approach the apex my eyes are looking down the front straight and I am squeezing on the throttle more. The car will want to start drifting out at the apex. I keep steering input from apex out allowing the car to start the drift. 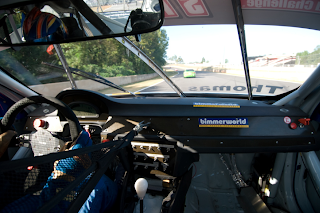 I have observed drivers adding extra steering input at the apex which upsets the car. At the track out I might touch the exit curb right as I shift to 5th gear. The lap has now been laid down and I relax getting ready to start one more lap exactly the same. 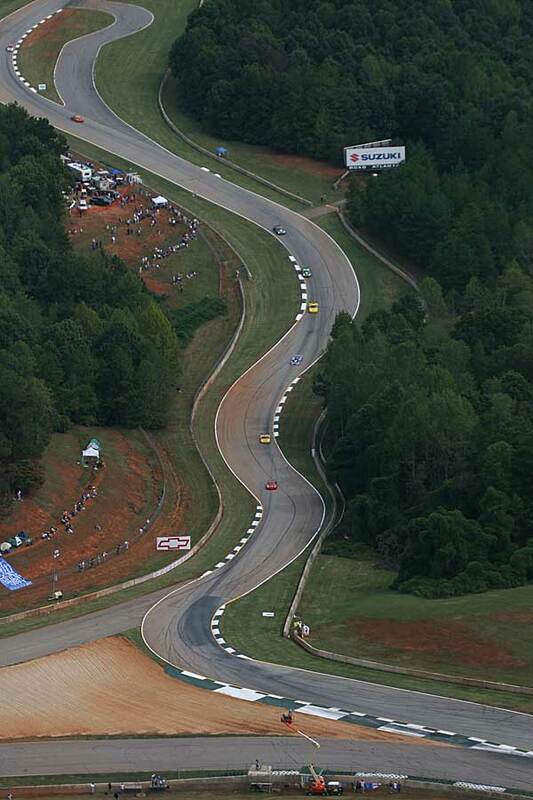 Road Atlanta is a fast track with a long straight and fast high speed turns with big elevation changes. This requires a car with higher spring rates and medium/high bars. The balance between the bars and springs comes with how much curb you prefer to use at some sections of the track. Speeds on the back straight are some of the fastest in North America. A GT3 Cup Car will see speeds in excess of 160 MPH and need to slow to around 60 MPH for T10A. Make sure your brake pads and rotors are ready for the heat and the abuse you will throw at them. My preference in pads at Road Atlanta are Performance Friction PFC01s. I love the initial bite, the friction they produce when hot, and the release. They are the pad I find well suited to the heavy and light braking zones at Road Atlanta and they don’t upset the ABS systems in today’s modern cars. Aero balance is really important as the majority of the turns are medium to high speed. The back straight is long enough you want to try to increase top end the best you can. I like to have a car with more aero stability as this will help keep your confidence for the high speed turns like T1, esses, and T12 helping yield a fast lap time. T7 to T10A. Long back straight where the exit of Turn 7 determines a big portion of you lap time. 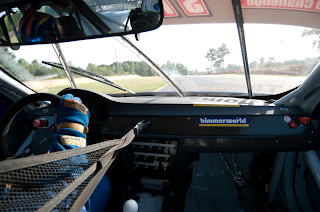 1-MPH or full throttle 10ft quicker on exit at Turn 7 can make the difference of over ½ second on your lap time. 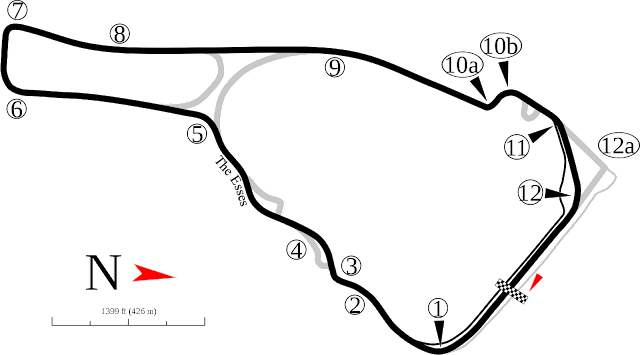 Turn 10B. Similar to Turn 7 as it helps determine your run onto the front straight. The sooner you can go full throttle the quicker the lap time. Turn 5. Most guys try to carry too much speed into the apex of Turn 5 instead of focusing on how soon they can go to full throttle coming out. Most of the drivers we feature on FASTER are available for coaching, probably one of the best investments you could make. How awesome is this post. Thanks AC and Seth. I've done 3-4 track days at RA since May, and it's always a great time. I think Seth may have been at a couple of those. Since there are more R turns than L, does this cause uneven tire wear? Any cause for concern? As to T5, I wonder if overcorrection is what caused the significant Corvette accident at the last Chin day there. Thank you for the kind words! Answers to your questions are below. 1. 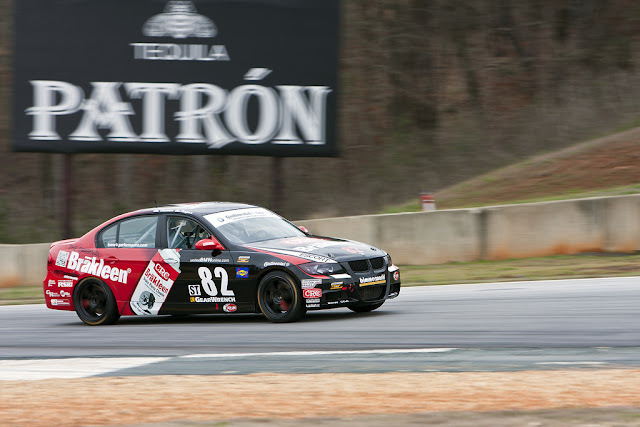 Yes Road Atlanta does cause uneven wear on the tires. The left front takes the brunt of the wear with the left rear taking the 2nd worse. It isn't really abusive on the tires so there isn't a lot of need for concern. If you want you can rotate the tires in a criss-cross pattern to help alleviate some of the wear. 2. I didn't see the incident so I can't comment on what happened. 3. Road Atlanta or AMP, that is a tough one. 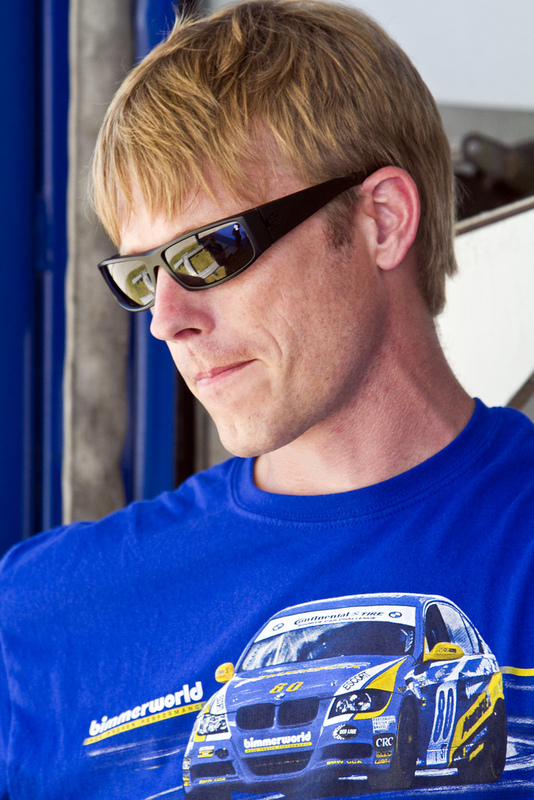 In November Chin Motorsports is having a weekend at both tracks. I should be at both of these event. If I had to choose one of these tracks to do I would choose the one I have not driven yet. AMP is new enough most people haven't driven. While it isn't as fast at Road Atlanta it does present itself with some very challenging turns and elevation changes! I believe the T5 incident was early application of throttle causing oversteer followed by an overcorrection and a spin to the right. High HP RWD cars can oversteer if throttle applied too early. Have also seen people afraid to use the extra wide curbing and turn too hard to stay on the track surface with a lift of the throttle that can also cause it. Instructor's advice to me regarding curbing at 5 - if you use it - straddle it with the tires or commit all the way over. Keeping just the right side on the curbing upsets the car quite a bit. Thanks for taking the time Seth, this makes me want to go back even more. RA might be my new favourite after having done the Chin event last month.